Amazon vs. Google: It’s the battle of the tech giants. Take any space, and you’ll find the two tech giants on a collision course constantly competing against each other to stay on top. On one side, we have the search giant Google which is the undisputed leader of the search realm, and on the other side, it’s one of the world’s most valuable companies and the online retail giant, Amazon. The digital dominance combined with the rise of online shopping, has exposed an overbuilt retail landscape and standing atop the food chain is e-Commerce titan Amazon. Google and its suite of ever-growing technologies are at the core of the culture of search. Google is operationalized across the Web as a way of life. Both Amazon and Google offer a host of services competing in almost every space from payment systems and Cloud to media and AI. Amazon, the e-Commerce titan of the 21st century, has grown from online bookseller to become one of the most valuable companies in the world. Amazon is undoubtedly the undisputed king of the e-Commerce landscape. From 30,000 employees in 2010 to 560,000 in 2018, Amazon’s business has grown tremendously and its success is largely influenced by its many innovative technologies which help the company maintain its dominant position in the digital space. The company’s achievements are not to be measured in mere numbers; there is more to it than meets the eye behind Amazon’s success. Over the last few years, Amazon has become the undisputed market leader in everything from cloud computing to voice technology to online retailing. Amazon currently boasts over 100 million active Prime members all over the world. Google is the next big thing after the inception of the World Wide Web. Google is the search’s most powerful innovator and it’s everywhere. Google is more than just a search engine; its unparalleled search technologies represent the culture of search. Google transformed the conceptualization of what it is to search the Web. Today, the very existence of the Internet relies in the ubiquitous Google search and without Google, almost everything would probably cease to exist. Whether it’s a new tech, or a new car, or a household item, or anything useful, shoppers always turn to Google for help. Google is a gamechanger; Google is a lifesaver; and it’s getting close to the Apple’s number one spot as the most valuable company in the world. Google is now a wholly owned subsidiary of Alphabet. – Google Pay, formerly called Google Tez, is the Google’s proprietary online payment system and fun way to pay through your smartphone. It’s a mobile payment app that allows you to pay for items purchased online or at local retailers who accept contactless payment. Amazon Pay is the Amazon’s proprietary online payment service which mostly uses the consumer base of Amazon.com providing a flexible mode of payment without any hassles. – Amazon Web Services, or AWS, is a comprehensive cloud computing platform from Amazon which provides companies of all sizes on-demand cloud infrastructure over the internet. AWS is a relatively new quadrant for business users compared to Google Cloud which has been active in the consumer space for some time. Google Cloud is a suite of public cloud computing services offered by Google. AWS is among the top two players in the cloud computing market and a benchmark of cloud service quality. – “Google Assistant” is the Google’s very own AI-powered voice-based digital assistant, whereas “Alexa” is the Amazon’s answer to Apple’s Sir and Google Assistant. Alexa lets you play music, control your smart home, get weather and news updates, get directions, and do more, with just your voice. Alexa can do everything what Google Assistance can do and more. Google is better with search results and Alexa is better in terms of device support. Alexa has better smart home integration while Google is has better social skills. – Both Amazon and Google are the marker leaders in the smart home ecosystem that offer a wide range of smart home products which are synonymous with their respective voice-based assistants. Google Home is the Google’s family of smart speakers powered by Google Assistant, which doubles as a smart home control center. Amazon Echo is a family of voice-based smart speakers developed by Amazon. While both are great smart speakers with exceptional connectivity, Google Home is better at getting information whereas Amazon Echo offers superior sound quality. – Amazon’s Prime Video is the direct competitor of Google-owned YouTube. Everyone is getting into the video business and with plenty of options to choose from, streaming services like YouTube and Prime Video are constantly fighting for the top spot. YouTube is all about generating leads through direct influences and earn from it. Amazon Prime Video, on the other hand, is more than just a money game; video is a key part of its marketing strategy to gain members and expand its online streaming market. Eventually staying ahead of the game. Both the technology giants are at the forefront of digital space competing in almost every field from online retailing and cloud services to digital payment system and smart home integration. Google is the undisputed king of the search realm, whereas Amazon is the fastest growing online marketplace which dominates the retail landscape. Amazon currently boasts over 100 million active Prime members all over the world, whereas the Alphabet-owned Google is getting close to the Apple’s number one spot as the most valuable company in the world. Sagar Khillar. "Difference Between Amazon and Google." DifferenceBetween.net. 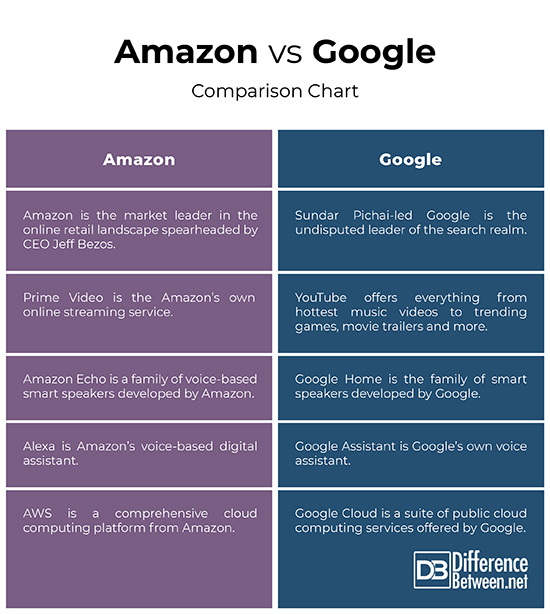 April 2, 2019 < http://www.differencebetween.net/technology/internet/difference-between-amazon-and-google/ >.